For me, food presentation is just as important as how the food tastes. And that’s why I get excited about recipes that taste good, look good, and are really easy to make. If your family is like ours, breakfast is often a rush and it can be hard to get all the nutrients you need to tackle the day and give you energy. But this past weekend I tried something new: Cheesy Avocado Baked Eggs from the KitchenAid blog. They took less than 30 minutes to prepare, looked great, tasted amazing and are really healthy. The eggs provide the protein, while the Avocados have four times as much potassium as bananas, are high in vitamin K, low in saturated fat, high in fibre, help increase antioxidant absorption, and contain Lutein and Zeaxanthin (for eye health). Cut your avocados in half and remove the pit. The bigger the avocado, the better, as there’ll be more room for your egg. Next you’ll want to core out a little extra avocado to make sure all of your egg can fit in the hole. Place the avocado halves on a baking dish. If they’re wobbling around, cut a small slice off the bottom so they sit better. Now you’re ready for the eggs! Carefully crack an egg into each avocado half. (It’s okay if a little egg white gets on the top of the avocado). I added a pinch of salt and a little pepper, and set them in the oven at 400°F for 15 minutes. The egg yolks were still a touch runny, just the way I like them. If you like firmer egg yolks, just bake for another 3-5 minutes. I finished them off with a little bit of Parmesan cheese and diced chives. You can add a little Sriracha sauce for some extra spice. And done! You’re ready to dig in and enjoy! Hey Buddy!, I found this information for you: "Cheesy Avocado Baked Eggs". 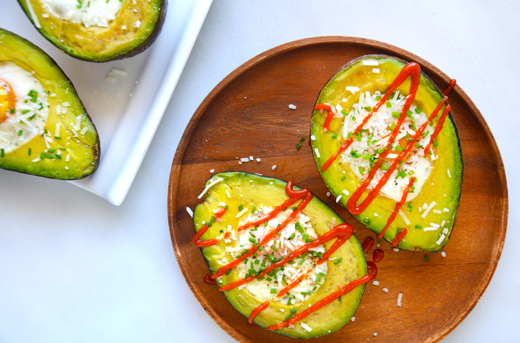 Here is the website link: http://shesinfluential.com/2016/07/27/cheesy-avocado-baked-eggs/. Thank you.